Home / Global News / 17 foot long, 140 pound giant python captured! Researchers have captured what they are calling the largest python to ever be removed from the Big Cypress National Preserve. It also noted the 140-pound snake was carrying more than 70 developing eggs - so, in effect, the capture helped eliminate 74 pythons from the Everglades. 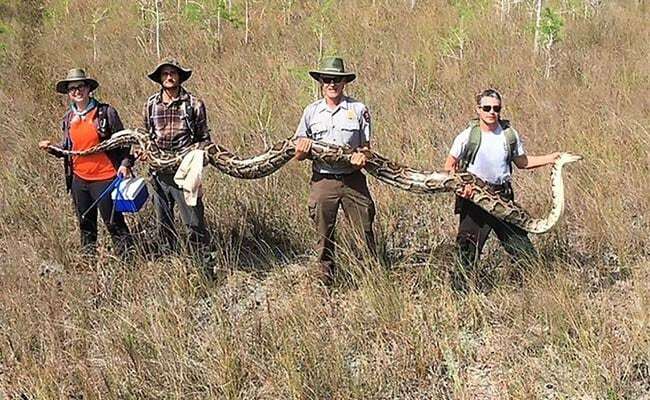 Officials said this is the largest python ever removed from Big Cypress National Preserve and that it was caught using radio transmitters. Pythons are native to Southeast Asia, Africa and Central and South America. "The team not only removes the invasive snakes, but collects data for research, develops new removal tools, and learns how the pythons are using the preserve". Rita Garcia, a spokesperson for the Big Cypress National Preserve, said the eggs were destroyed and the snake was euthanized.